This formidably powerful and slick-sounding bundle reaffirms Yellow Tools' status as one of the premier vendors of sample-based goods. Powerful sampler engine. 70GB of excellent content. Easy remote control feature. Live and FX are useful additions. Import of VST plug-ins. Complexity can be daunting. Sample content is not exhaustive. Yellow Tools' original Independence sampler ticked all the boxes for sampling luxury, marrying horsepower with an excellent, focused sample library. However, Native Instruments' Kontakt still remains the samplist's apparent favourite. It's hardly surprising, then, that YT's latest package, Independence Pro, takes a broader approach, featuring three interrelated applications and a bonus utility. First up, Independence becomes Independence 2, offering a completely redesigned audio engine. Features include adjustable multicore CPU support (up to eight cores), VST plug-in compatibility, multiple insert effects, a 70GB sound library, a new browser, and an enhanced quick-edit screen with remote control. Second, Independence FX is a new incarnation of the Freedom rack-style effects plug-in. This contains over 40 effects, including the Origami impulse response processor. With its extensive surround support (up to 8.1), integrated browser, multiple presets, unlimited instances and even VST plug-in import, YT's intentions are clear. Completely new for this package is Independence Live. Designed primarily as a front-end to enable the standalone live use of Independence 2, you can load multiple patches, switching on the fly manually or using program changes. Finally, Independence Pro ships with a special version of Chicken Systems' Translator, which is a useful tool that enables the conversion of just about any sample to or from the Independence format. Without wishing to play down the importance of Independence Pro's FX and Live element, the sampler is clearly the core one. Visually, it's very similar to the previous version, and in practical terms the sample system, which is based on sections, layers, layer sets and projects, also remains the same. If you're looking for comparisons, each layer is effectively a typical sample program - made up of sections, samples, zones, velocity layers, insert effects and so on. However, I2's sampling engine facilitates seriously complex sample allocation, and with up to 32 sample options per note, it goes way beyond what most samplers allow. 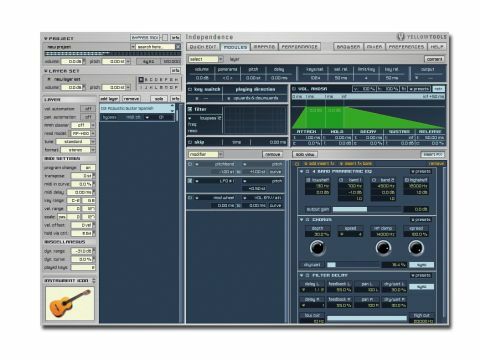 Beyond this, you're looking at a typical multitimbral design, incorporating numerous layers (layer sets), MIDI channels, an audio mixer and global effects. In layout terms, the layer hierarchy is available on the left-hand side, while visual elements such as mapping, envelopes, effects, the browser and mixer appear as tabs on the right. As we've said, the sample engine is powerful, and consequently you need a flexible way of editing it. For this reason, one of the tabs is dubbed Modules, enabling you to change parameters such as pitch, envelope and filter, while also making external modifier assignments. Most significantly, you can choose the section of the layer you want to edit, from a single sample to the whole thing. One great improvement with I2 is the inclusion of all of YT's sample libraries. This means you not only get the full acoustic bank from I1, containing guitars, basses, drums, organs, pianos and the orchestral set, but also Candy (saxophones), Majestic (basses) and Culture (percussion). The emphasis is on traditional instruments rather than synths, loops and so on. On the synthesis front, I2 includes a number of modifier options including an arpeggiator with MIDI file import, a step sequencer, step modulator and glide option on top of the more typical LFOs, pitchbend, modulation and so on. These facilities are used in a handful of presets, showing that I2 is excellent at synth sounds and sequences. But with no more than 100 presets, these aspects are rather under-utilised. Many of I2's presets use keyswitching to access multiple articulations. To keep things clear, the left hierarchy panel can be switched to show the content of a layer with a list of the available articulations and their switching key. Very useful, though if keyswitching is your thing, you can't beat having a full 88-note keyboard. Although I2 comes in plug-in and standalone forms, the idea with Independence Live is that it enables you to load up multiple instances of the sampler and flick between them on the fly. In use, this amounts to a rack setup with multiple slots into which you load Independence programs (though, strangely, not straightforward layers). MIDI is configurable on a channel-by-channel basis (useful if you have multiple controllers), and again, Yellow Tools has included the eight assignable knobs and buttons. Changes to programs are simple enough (clicking 'edit' launches the familiar I2 window). Independence Live is straightforward and conceptually not unlike Logic Studio's MainStage. It's worth mentioning that to do this you have to copy them to the I2 VST folder. But for Mac users at least, it's definitely worth it, as it's a quick and easy way of running VST plug-ins inside AU-only applications such as Logic. Sonically, I2's library and the included extras (Candy, Majestic and Culture) are excellent, and if there's something you don't like, rest assured that you can tweak pretty much everything. We should also mention the onboard insert effects. These range from the typical (EQs, compression, delay and filters) to the useful (reference tones, channel manager and surround panner), and you can even patch in VST plug-ins. But what's really significant is that you can apply effects using the Modules parameters to any section you like - a single sample file, the whole layer or anywhere in between. Powerful stuff. Finally, new to I2 are the eight freely assignable knobs and buttons. These can be set up manually or with the learn feature, making it easy to connect your controller to I2 or to control buried parameters from the Quick Edit page. Independence Pro is clearly part consolidation and part new territory. And there's no doubt that for the new user at least, I2's precise but complex interface could prove frustrating. However, if you want excellent 'real-life' sample content and playback, this is an enormously seductive package. Admittedly, it's complicated, but if you're willing to put the time in, Independence is very rewarding indeed.